At this past week’s Regional Transit Committee meeting, the Atlanta Regional Commission’s David Emory made an interesting presentation. A total of eight light rail projects are included in the Concept 3 plan. They would cost about $8 billion to build, and they would have an annual operating cost of $200 million. Coincidentally, if metro Atlanta voters past a regional sales tax for transportation, it would raise about $8 billion over 10 years. I couldn’t help myself. I began to think about how wonderful it would be if the Atlanta region would spend most, if not all, of the new sales tax revenue on transit projects. The eight light rail projects in the Concept 3 Plan actually would be a good starting point. The first project was building the 22-mile loop for the Atlanta Beltline, now being planned by MARTA and Atlanta Beltline Inc. The second light rail project was the Clifton Corridor light rail line that would connect MARTA’s North lines with the East line and Emory University and the Centers for Disease Control along the way. The third project would be building light rail along the I-20 East corridor, a line that could extend to Rockdale County. The fourth project would be to build light rail along the top end of I-285 between I-75 and I-85 (a transit specific study for the corridor is supposed to be done in 2012). The fifth light rail project would be along the Northeast corridor going from Doraville, Norcross to the Gwinnett Village and the Gwinnett Area. That feasibility study is supposed to be completed later this year. The sixth project would be to have a light rail line along the Northwest corridor in Cobb County, going along U.S. 41 from the Cumberland Mall area up to Town Center. The seventh proposed line would be a fixed rail line along the Georgia 400 corridor — either extending the existing MARTA heavy rail line or building a light rail line towards the northern parts of Fulton County. The eighth (and last) light rail project in the Concept 3 Plan is the Atlanta streetcar project that would go from downtown to Buckhead, and connect the tourist attractions around Centennial Olympic Park with the King Center. The Regional Transit Committee, now chaired by Atlanta Mayor Kasim Reed, passed a resolution this past Thursday to endorse establishing a permanent transit governing body for the Atlanta region. The resolution was part of a “quad party” agreement between the Atlanta Regional Commission, the Georgia Regional Transportation Authority, the Georgia Department of Transportation and MARTA. Never before has there been such a level of consensus among all the 10 ARC counties and all the major transportation-related entities in the state and the region. And that can only be a welcome development for the region. But then on Friday morning, metro Atlanta leaders launched a campaign to build a “big tent coalition” to support a regional sales tax for transportation. They unveiled a plan to raise millions of dollars for the campaign to convince people to vote in favor of the sales tax. Metro leaders brought in representatives from the cities of Phoenix, Denver and Salt Lake City to talk about how they were able to put together winning campaigns for their transportation sales tax initiatives. In showing TV spots on their marketing campaigns, the themes were the same. We can’t pave our way out of congestion. If we want to accommodate new residents to our region, we must invest in transportation options. Every one of those campaigns showcased light rail projects in their separate communities. And the various representatives spoke about how important it was to listen to voters before presenting a list of projects. In Denver, leaders realized that voters were far more likely to pass a transportation sales tax if most of the dollars were to be invested in transit and rail. The representatives from Salt Lake City, Denver and Phoenix said it was critically important to sell the sales tax as a quality of life campaign. In Utah, part of the effort included explaining to voters that no transportation projects pay for themselves, including transit. Lane Beattie, president and CEO of the Salt Lake City Chamber of Commerce, said it was all about economics and how Utah would be able to handle all its growth. Because the city has been building 70 miles of light rail, there is now $4 billion in development underway with national companies moving to Salt Lake City. Peggy Bilsten, who worked on getting the sales tax passed in Phoenix, said the city’s “Transit 2000” campaign ended up building a 22-mile segment of light rail connecting three different cities. Maria Garcia, who worked on the Denver effort, did make a back-handed comment. “The longer you guys take to get your act together, the better it will be for us,” she said. That reminded me of what the U.S. Secretary of Transportation Ray LaHood told Georgians when he was in Atlanta nearly a year ago. He said Georgia would get left behind in transportation funding if it didn’t get its act together on transit and rail. The region can decide whether the referendum of 2012 will be a game-changer and help pay for transit once and for all, or whether it will be more of the same — spending the region’s limited dollars on roads and bridges. For the first time in decades, the Atlanta region has an opportunity to invest substantial dollars in transit, be able to leverage federal funds and to encourage transit-friendly developments. What’s so conservative about federal highways? Conservatives do not like public transportation—or so libertarians and Republican officeholders tell us. If that means we must spend hours stuck in congested traffic, so be it. Under no circumstances would conservatives ever ride public transit. Except that we are riding it, in growing numbers. Studies of passengers on rail-transit systems across the country indicate many conservatives are on board. Chicago’s excellent METRA commuter trains offer one example. A recent survey revealed that in the six-county area METRA serves, 11 percent of commuters with incomes of $75,000 or more commuted by train. In Lake County, the mean earnings of rail commuters were more than $76,000. (The figure for bus riders was less than $14,000.) Not surprisingly, the area METRA serves regularly sends Republicans to Congress. So why are conservatives using the public transportation we are told they oppose? Because being stuck in traffic isn’t fun, even if you are driving a BMW. On a commuter train or Light Rail line, you whiz past all those cars going no-where at 50 or 60 miles per hour—reading, working on your laptop, or relaxing, instead of staring at some other guy’s bumper. Still, libertarians shriek, “Subsidies!”—ignoring the fact that highways only cover 58 percent of their costs from user fees, including the gas tax. To understand how conservatives might approach transportation issues more thoughtfully, we need to differentiate. All public transit is not created equal. You will find few people with alternatives sitting on buses crawling slowly down city streets. Most bus passengers are “transit dependents”—people who have no other way to get around. But most conservatives have cars; they are “riders from choice,” people who will only take transit that offers better conditions than driving. They demand high-quality transit, which usually means rail: commuter trains, subways, Light Rail, and streetcars. Here we see one of the absurdities of the Republican position on transit. During the recent Bush administration, it was virtually impossible to get federal funding for rail-transit projects; buses were offered instead. But most Republicans’ constituents are served by rail transit. The perception that conservatives do not use public transportation is only one of the mistaken notions that has warped the Right’s position on transportation policy. Another is that the dominance of automobiles and highways is a free-market outcome. Nothing could be further from the truth. Were we to drop back 100 years, we would find that Americans were highly mobile. Their mobility was based on a dense, nationwide network of rail transportation: intercity trains, streetcars, and interurbans (the latter two electrically powered). Almost all of these rail systems were privately owned, paid taxes, and were expected to make a profit. But they were wiped out by massive government subsidies to highways. Today’s situation, where “drive or die” is the reality for most Americans, is a product of almost a century of government intervention in the transportation market. Another misperception is that public transportation does not serve conservative goals. Again, to understand the real situation we must differentiate between buses and trains. Buses do help the transit-dependent get to jobs, but for the most part, it is rail transit that serves conservatives’ goals. Subways, Light Rail, and streetcars often bring massive economic development or redevelopment of previously rundown areas. Portland, Oregon built a new streetcar line, a loop of just 2.4 miles, for $57 million. It quickly brought more than $2 billion in new development. The small city of Kenosha, Wisconsin put in a streetcar line for just over $4 million. It immediately brought $150 million in development, with another $150 million planned. Not surprisingly, both cities are expanding their streetcar systems. Buses have no such effect on development because a bus line can be here today, gone tomorrow. The investment in track and overhead wires streetcars and Light Rail require tells developers the service will be there for years to come. Another conservative goal rail transit and intercity passenger trains advance is energy independence. One of America’s greatest national-security weaknesses is our dependence on imported oil, most of it coming from unstable parts of the world. One of the Bush administration’s objectives in invading Iraq was to secure a major new source of oil; predictably, we got war but no oil. Electric cars may eventually become practical, but optimists have been disappointed before: Thomas Edison was certain that the necessary breakthrough in battery technology would occur in his lifetime. In the meantime, trains can be electrified, and even when diesel-powered they use fuel far more efficiently than do automobiles. The list of reasons that the libertarian/Republican policy of opposing public transportation, especially rail, is wrong could run many pages. A more interesting question is what a thoughtful conservative position on transit might be. Russell Kirk offers a starting point for crafting an answer. He said that the first conservative political virtue is prudence. And there is nothing prudent about leaving most people immobile should events beyond the pale cut off our oil supply, as happened in 1973 and 1979. At present, half of all Americans have no transit service, and of those who do, only half call it “satisfactory.” The effects of suddenly stranding half the population are grim to imagine, not least on our already shaky economy. Grimmer still is the prospect of going to war to seize the missing oil. Prudence suggests the first goal of a conservative transportation policy would be to provide options, ways to get around without a car. Conservatism offers a further guidepost: a predilection to turn to the past for answers to today’s problems. My old friend and colleague Paul Weyrich and I discovered that, as children in the 1950s, we shared a favorite television program: “I Remember Mama.” Each show opened with a modern woman being baffled by a contemporary problem. Then, reverently, she would say, “I remember Mama …” and the viewer would be transported to the 1890s, where Mama would demonstrate how an earlier generation had resolved the same difficulty. Conservatives like to remember Mama. In transportation as in many things, the past was in some ways better than the present. Thanks to the Pullman Company, the night boats, our cities’ excellent streetcar systems, and the fast, electric interurbans that connected cities with towns and the countryside, earlier generations weren’t merely transported like so many barrels of flour. They traveled. Today, whether driving on the bland Interstate Highways or flying, Americans are just packaged and shipped. So to Russell Kirk’s prudence let us add a conservative motto: what worked then can work now. In practical terms, where do these twin starting points lead conservative transportation policy? First, we need a National Defense Public Transportation Act. As late as the 1950s, it was still possible to travel from anywhere in America to pretty much anywhere else in the country on a network of buses and trains. But President Eisenhower’s National Defense Interstate Highway Act, which has poured $114 billion into highway construction, killed the privately operated passenger train. We’re left with only a shadow of a wraith of its ghost in Amtrak’s skeletal national system. A National Defense Public Transportation Act would seek to recreate that lost network of trains and buses, bit by bit as we can afford to do so. It would offer every county that choose to participate—conservatives believe in local options—a bus timed to connect its largest town with the nearest intercity passenger train. As time went on, it would thicken the network of trains so that a journey was made more by train and less by bus. For cities, conservatives’ banner should read, “Bring Back the Streetcars!” It is no coincidence that the decline of America’s cities accelerated when streetcars were replaced by buses. People like riding streetcars, while few like riding buses. Streetcars are “pedestrian facilitators.” It is easy to hop off, shop and have lunch, then get on the streetcar again when feet get tired. Pedestrians are the lifeblood of cities; it is no accident that the first three chapters of Jane Jacobs’s great book The Death and Life of Great American Cities are about sidewalks. Buses do have a role to play, mostly as feeders for rail lines. Express buses that run directly from outlying suburbs into city centers can also draw “riders from choice.” These buses can be electrified with two overhead wires; unlike diesel buses, trolley buses neither smoke nor stink. San Francisco still has a nice network of them, thanks to all her steep inclines. With streetcars should come two other revivals from the past: interurbans and night boats. Interurbans were big, fast streetcars—often very fast, running at 60 to 80 miles per hour in the open countryside. Interurbans connected big cities with outlying towns. Ohio alone had more than 2,000 miles of interurbans, all running on electricity. Today, just one remains, the South Shore between South Bend, Indiana and Chicago. On the Great Lakes and major rivers, we also had night boats, wonderful steamers, often side-wheelers, that connected cities like Cleveland with Buffalo and Detroit. Like night trains, they offer no-real-time travel. Board in the evening, enjoy a good dinner in the grand salon and a restful sleep in your cabin, and arrive at your destination at the beginning of the next business day. One point conservatives should insist on in reviving our trains, streetcars, and interurbans is keeping costs down. The greatest threat to a revival of attractive public transportation is not the libertarian transit critics. It is an unnecessary escalation of construction costs, usually driven by consultants who know nothing of rail and traction history, are often in cahoots with the suppliers, and gold-plate everything. Overbuilding is omnipresent; some Light Rail lines (the current term for interurbans) look as if they were designed for the Shinkansen. We are now seeing construction cost figures for streetcar lines of $40 million per mile and for light rail sometimes of more than $100 million. A simple management tool could quickly bring costs into line: “should cost” figures. These are standards based on experience; anything that exceeds them should require very detailed and highly convincing analyses. For streetcars, the “should cost” figure ought to be $10 million per mile, and for light rail, $20 million. Lines have been built for that, and less. In our book, Moving Minds: Conservatives and Public Transportation, Paul Weyrich and I offer a chapter titled “Good Urban Transit: A Conservative Model.” We illustrate a variety of ways to keep costs down, beyond “should cost”: using existing rail infrastructure (the head of one transit system told me, “In my city, they wanted to spend $1 billion to build an 18-mile Light Rail line parallel to an existing double-track railroad.”), running streetcars on existing Rapid Transit lines to access the suburbs, and perhaps most important, avoiding the foxfire allure of high technology. All the technology needed to run electric railways, and run them fast, was in place 100 years ago. It was simple, rugged, dependable, and relatively cheap. In the 1930s, many of America’s passenger trains, running behind steam locomotives, were faster than they are now. (After World War II, the federal government slapped speed limits on them.) There is no need for Maglev, monorails, or other innovations. All these do is drive up costs, reduce reliability, and make the unhappy user dependent on proprietary technologies. Simplicity is a virtue when it comes to transportation policy. That past/future transportation network of course includes automobiles. But Americans would no longer be dependent on cars. Our mobility wouldn’t be held hostage by events overseas. Nor would we have to drive to leave the house, regardless of weather, old age, traffic congestion, or the myriad of other conditions that make automobiles less than convenient. We will still use cars to go to the grocery store; no one wants to lug home ten bags of groceries on a streetcar. But for commuting to work, going downtown to a show or game, or traveling to see Grandma or on business, we would not be harnessed to the horseless carriage. America’s motto would no longer be “drive or die.” Many people, not just conservatives, might find that an attractive proposition. William S. Lind is the coauthor of Moving Minds: Conservatives and Public Transportation and the director of The American Conservative Center for Public Transportation. Earlier this year, First Lady Michelle Obama established Let’s Move, a program with the ambitious and important goal of ending childhood obesity within a generation. And yesterday, a conference called “Keeping Kids Moving” examined the ways transportation policy can help America achieve that goal. The sad truth is this: today, 32% of children in the US are overweight or obese. That means one in every three of our nation’s children are at risk for serious health conditions like diabetes, asthma, heart disease, and stroke. America is beginning to understand that childhood obesity is a national problem. And we need to look for solutions wherever we can find them. At DOT, we know transportation can be part of the solution, because the way people travel shapes our communities and affects our levels of physical activity. We recognize that transportation is a public health issue. But, as Undersecretary Kienitz told yesterday’s meeting, DOT has taken steps to fix the formula and find a different approach. Through our work with HUD and EPA in the Obama Administration’s Partnership for Sustainable Communities, through our TIGER discretionary grants, and through a range of other programs like Safe Routes to School, we’re funding the kinds of projects that will help develop livable communities and provide opportunities for people to walk, bike, or take transit. Everywhere I go, I hear from Americans that this is what they want. In fact, walking and biking have increased by 25% in the last ten years. People want options. They want to be able to be more physically active on streets that are friendlier to pedestrians and bicyclists. And when adults model physical activity, our kids see it, and they get it. But the link between transportation and obesity doesn’t end there. Also at yesterday’s meeting, Nashville’s Adetokunbo Omishakin talked about the more than 6,000 households in Nashville who don’t own a car and are not within a mile of a grocery store. At certain times a bus trip to a grocery store could take three hours round-trip. So residents buy food for their families at convenience stores or small groceries whose shelves can’t offer the healthy options of larger stores. You see, it’s not just about improving sidewalks or bike paths. The assumption of the last half of the 20th century was that people would own cars. And because that isn’t true, people have been forced to make choices that contribute to the obesity trend. That’s why, for example, our recent Urban Circulator and Bus Livability grants have been received so warmly. This is about connecting communities. It’s about solving real problems. This is the kind of practical change the Obama Administration is delivering. Wider roads and new freeways and highways are a big part of the President Obama's stimulus plan, except many urban areas want to tear down highways and freeways, not build them. Vice President Joe Biden took the wraps off the administration’s most recent report card on the economic stimulus package today. The White House says — and this number is probably subject to political interpretation — that it has created roughly three million jobs in the past year or so. A lot of that work is being done on infrastructure, building and fixing bridges and highways. Dozens of cities around the country have just the opposite in mind though. They want to tear down parts of some freeways. From WNYC in New York City, Andrea Bernstein reports. Near the lower tip of Manhattan, Michael Sorkin is standing just yards from the East River and Brooklyn Bridge, but you can barely see them. So he looks up. We see traffic that is in at least three different levels. There’s the FDR Drive. There’s an interchange to get people onto the Brooklyn Bridge that’s flying over the FDR Drive, and then flying over that is the Brooklyn Bridge. Sorkin is an architect and head of urban design at City College of New York. He’s drawn up a different blueprint for this patch of Manhattan. Tear down a section of the elevated highway, the on-ramps and cloverleafs. You would see one of the most beautiful architectural achievements in the history of consciousness, the Brooklyn Bridge. There would be parks, plazas, restaurants. You would see boats cruising by. Sorkin drew up these designs as part of an international exhibition by the group Institute for Transportation Development Policy. As crazy as it sounds, the idea of tearing down highways in dense urban areas is ricocheting around the country. Cleveland is planning to convert a lake-front expressway to a boulevard by 2012, and Seattle is moving to tear down adouble deck highway by that same year. Back in New York, teacher Carmen Gand was walking her dogs near the FDR Drive. Her reaction to a proposed teardown is typical. People are going to drive into Manhattan regardless, so why not make as many roads or possibilities to get into Manhattan as possible? It turns out that New York actually tore down an elevated highway in the 1970s. Sam Schwartz was the chief engineer for the NYC Department of Transportation then. And people panicked. They thought that was Armageddon. The highway had begun to crumble, so the city dismantled 60 blocks and replaced it with a regular street. After that, we had trouble tracing about one-third of the people. Transit went up. We had the same number of people coming in, but they weren’t coming in by cars. San Francisco also lost freeways in the 1989 earthquake. Some years later, the San Francisco Chronicle wrote a story about it. The headline: “Traffic Planners Baffled by Success: No Central Freeway, No Gridlock, and No Explanation.” Engineers found that traffic volume had dropped from 93,000 cars a day to 45,000. But what happens in city where there isn’t a lot of public transit? “You want to do what? Tear down a freeway?” Oh, they thought I was nuts. John Norquist was mayor of Milwaukee from 1988 to 2004. He wanted to take down the Park East Freeway, which ran through downtown. A lot of people realized it was ugly and all that, but they said what would you do with the 40,000 cars a day that use it? Norquist is now the president of the Congress for the New Urbanism, a group that promotes denser communities. He says in 2002, when he tore down the highway, downtown congestion didn’t jump. Instead, it dispersed all around city streets and business activity in the area went up. Skeptics remain, like Robert “Buzz” Paaswell. He says goods and services must be able to move through cities. You just can’t take out a link in a highway and expect nothing to happen. Paaswell is an engineer who’s interim president of City College of New York. He says without city highways, some people will find it harder to get around. 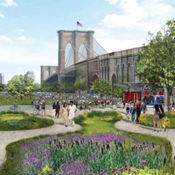 New York officials haven’t endorsed any plans to dismantle the southern tip of the FDR Drive. But around the country, mayors and governors are eying urban highway teardowns as the road to development, not congestion. In New York, I’m Andrea Bernstein, for Marketplace. The report is part of the public radio Transportation Nation project. For photos and links to some of the traffic studies, go to Marketplace.org. Crosswalks. Some would rather watch paint dry than talk about crosswalks. But well-designed crosswalks can make all the difference in the world when it comes to developing a city that welcomes pedestrians. Atlanta’s crosswalks — or lack there of — is one of my pet peeves. There’s probably no better barometer about how pedestrian-friendly a city is than the way it designs and maintains its crosswalks. Friends of mine roll their eyes when I start talking about the beauty of painted piano keys that safely outline the space reserved for those walking from one side of the street to the other. Those wide white-painted stripes command respect for pedestrians and clearly communicate to cars their boundaries.